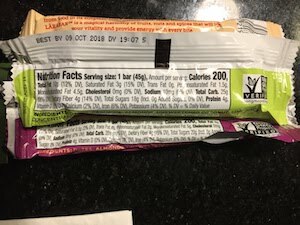 We got a chance to review a bunch of Freedom Bar flavors, and took them head to head against Paleo & Whole30 compliant larabars (SCD compliant as well). Here’s what we liked and didn’t like.. Following the Paleo and SCD diets, I tend to keep a few Larabars around as an emergency snack/desert for times when I’m on the go. So I was very excited when a new company with an alternative date/nut bar with a high percentage of organic ingredients contacted me about reviewing samples of their bars. I have read the warnings about Larabars for those using Paleo/SCD to heal from autoimmune conditions – that they are quite sweet because of the high number of dates in them, and that they should be eaten sparingly. I tend to agree with that advice, and for the first few years of being grain/refined sugar free, I mostly avoided them. But now that this has really become a long term lifestyle for me (6 1/2 years and counting), it’s been great to have the option of Lara Bars for those times I need it – such as traveling, hiking or generally being out and about. But I’ve always wished they used organic ingredients, so I’m thrilled to have found the Freedom Bars as an alternative. Freedom Bar (available on Amazon! ), was founded by someone who (like me) has Crohn’s (an autoimmune condition). He created the bars based on a recipe he used himself to bring freedom back into his life while following a specialty autoimmune diet. 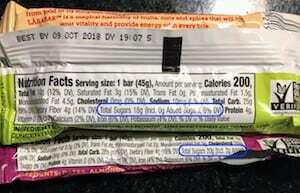 And just like the subset of Larabars that are Paleo/Whole30 approved, the Freedom bars also contains the same basic list of whole food, nut and date, ingredients. 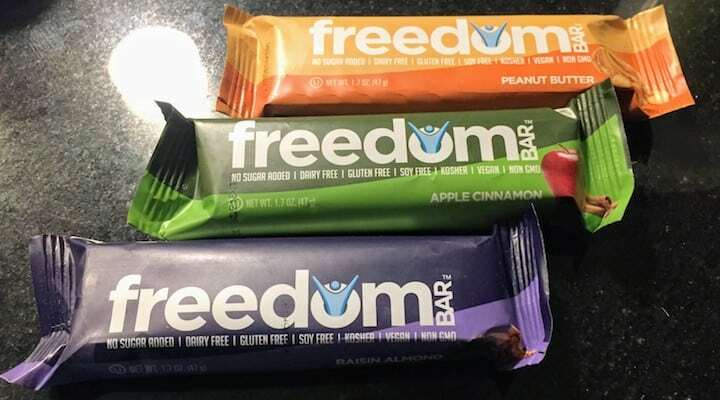 Update: We were recently sent an additional batch of Freedom Bars from the company so that we could sample the bars now that they switched over to all production in-house in their facilities (they came directly from Amazon but were paid for by the company). 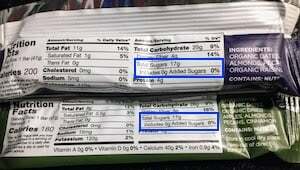 My partner and I did notice the ingredients in the bars tasted even fresher than the previous bars we had received. 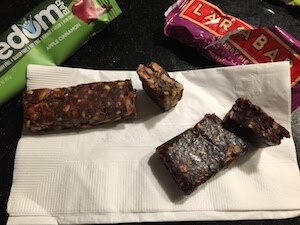 I would say that is one of the selling points of these bars in comparison to Lara Bars or other whole food date bars on the market – the ingredients taste fresh and are more flavorful. This may just be because I typically buy Lara Bars from Whole Foods, Trader Joes or other health food stores and they could have been sitting there a while. 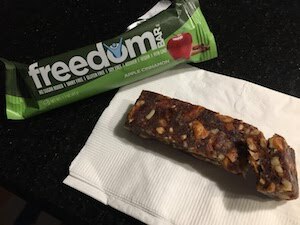 But between the larger chunks of nuts and the fresher tasting ingredients, we were both impressed by these new Freedom Bars. Which Larabars are whole30 compliant? Which Freedom Bars are Whole30 compliant? 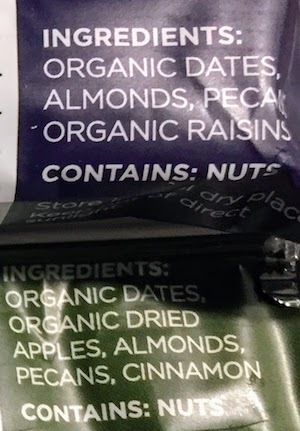 As you can see in the photo above, unlike the Larabars that have been listed as Whole30 and Paleo compliant, the main ingredients by in Freedom Bars are organic. For me at least, this is a huge benefit of the Freedom Bar vs Lara Bars. There is a specifically organic line of Larabars, but I have to say that I’m not thrilled with some of the powdered ingredients and also have been a bit turned off by the mixed vegetable/fruit flavors, which are the only options in that organic line. I wish it were 100% organic, but they are way ahead of Larabars and a good reason I will likely switch over for most of my snack bar needs (although it’s always nice to have the variety of both options). 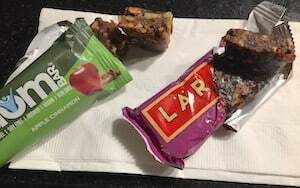 In my personal taste test between several Freedom Bars and some of my favorite Larabars, I found them to be relatively similar, but with some notable differences that someone who eats a lot of these bars will definitely pick up on. First of all, you’ll notice that the Freedom Bars tend to have larger chunks of nuts than your typical larabar, which tends to have a more blended or mixed consistency. I kind of liked the separation in the Freedom Bars of the larger nut pieces surrounded by the dates – it gave the bars a nice crunch. However, I will say sometimes it’s nice that the Larabars are blending the ingredients to try to make a more uniform taste that incorporates all the distinct flavors together – so it may depend on my mood. These are also the Larabars that are the most similar to the flavors and ingredients of Freedom Bars available – see the next section for which 3 are Whole30/Paleo friendly. 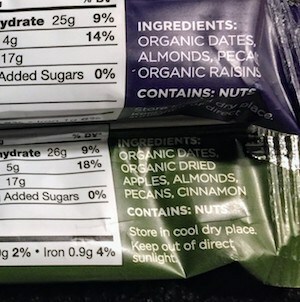 Apple Cinnamon Freedom Bar – see the ingredients in green in the photo above. Chocolate Cocoa Freedom Bar – as cocoa powder is technically Whole30 approved, the Chocolate Cocoa Freedom Bar flavor is technically allowed on the Whole30 (but not on diets like SCD). The listed ingredients are Organic Dates, cocoa, walnuts, almonds and sea salt. 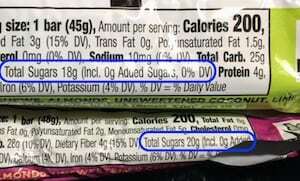 The Larabars touted as being Paleo and Whole30 compliant do not contain any added refined sugars according to their nutrition labels, but still for those avoiding natural fruit sugars, the date content of the bars can translate into a fairly high amount of natural sugar from the fruit. 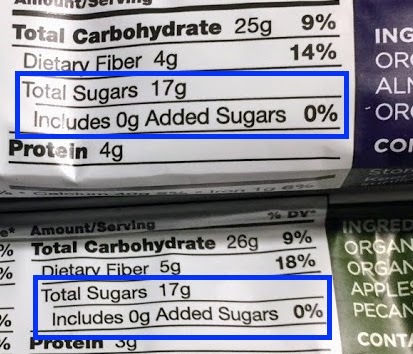 In Whole30 Lara Bars, the sugar (the natural result of incorporating whole dates), tends to be reasonable but on the sweeter side (more dates). However, the majority of Larabars have 18 grams or more of naturally occurring fruit sugar from the dates. Freedom bars on the other hand, tend to have 17 grams of naturally occurring fruit sugar or less (the chocolate cocoa, which contains Whole30 and Paleo friendly ingredients, has only 14 grams of natural date sugar). But the two I would tend to recommend for most people on refined sugar free, grain/gluten free diets, Apple Cinnamon and Raisin Almond both have 17. Although the majority of Larabars do not contain organic ingredients, for example all the Larabars listed in that 2015 Whole30 blog post about the Whole30 approved Lara bars, the company has released a line of a few bars that do contain organic ingredients. They call this their Larabar organic with superfoods line of bars. There are currently three bars. On the plus side, all ingredients are organic. Two of the bars do contain cacao powder and one of those contains hemp seeds, so it will depend on how you feel about those ingredients whether you’d like to try them. 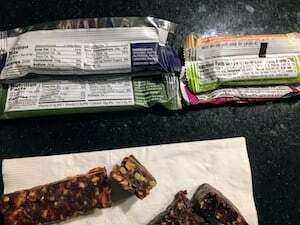 Out of these bars, the one I would most likely consider is their turmeric, ginger and beet bar (the one which contains all SCD approved ingredients), but as it uses beet powder and turmeric powder, it may be a judgement call for many whether that fits in with their version of Paleo and Whole30. If you are on the specific carbohydrate diet or GAPS diet for autoimmune disease, you will likely want to tread carefully with both Larabars and Freedom Bars. I have read numerous accounts online of those in early stages of the SCD diet mentioning that eating too many Larabars can cause set backs. For those on other autoimmune related diets such as the as the Paleo AIP diet, Larabars and Freedom bars would be off limits due to their nut content, for starters. That said, as I have been on the my specialty autoimmune diet for many years and feel that I am in a recovery phase, I do incorporate these types of bars as a small part of my diet for convenience. The creator of the Freedom Bars did so to help with exactly this type of situation of trying to make following a challenging specialty diet for autoimmune disease more reasonable to follow, so it is something to consider. Just remember to tread carefully while still healing.